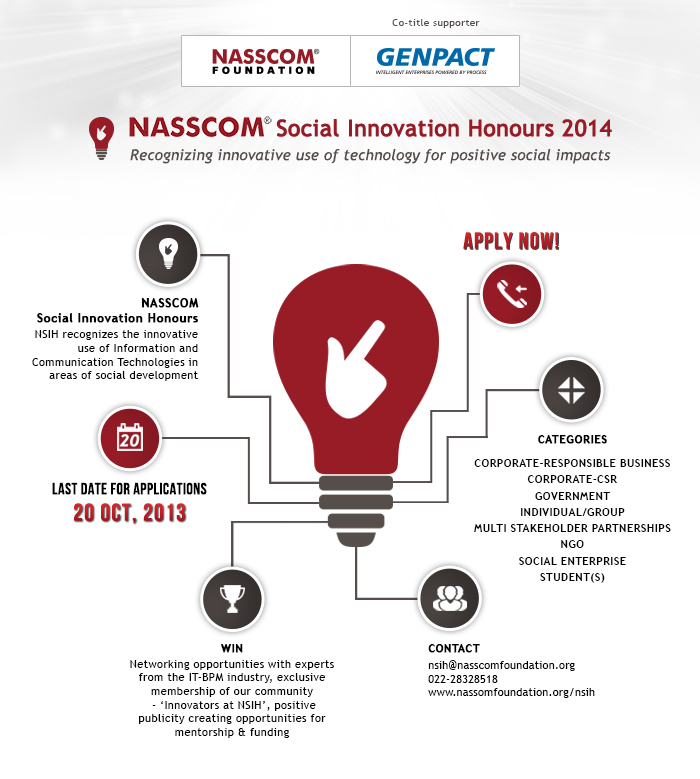 Celebrating the spirit of innovation and Technology for Social Good, NASSCOM Foundation, in association with Genpact, is proud to announce the launch of the sixth edition of the NASSCOM Social Innovation Honours – NSIH 2014. The Honours recognize innovations that creatively leverage Information and Communication Technology to create solutions in the form of a principle, an idea, an intervention or a combination of all of the above, to address gaps in social development. The Honours have recognized innovations focused on financial inclusion, employability, education, health, employability, governance, financial inclusion, and citizen services in the past. Entries for this year’s edition are now open and the winners will be honored at the NASSCOM India Leadership Forum early next year. 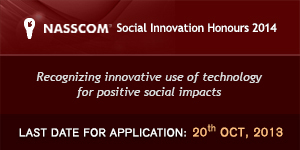 NASSCOM Foundation invites innovators to apply for the NASSCOM SOCIAL INNOVATION HONOURS 2014 and use the opportunity to be part of the growing tribe who are thinking unreasonably to bring change. The Honours serve as an exceptional platform for the winners to drive home an opportunity to network with the thought leaders in the space of technology and innovation and enhance their initiatives. Last year, many innovative projects showcasing their innovations, from student led projects like “D-Labs”, a complete hardware and software solution that diagnoses dyslexia at an early stage by tracking eye and hand movements of children to larger projects by NGO’s like Don Bosco Forum for the Young at Risk which had developed an online comprehensive Child Tracking System for effective data management, monitoring and reporting of care, protection and development of children were awarded at the Honours. NASSCOM Social Innovation Honours 2013 also saw some excellent individual led innovations like Stipator, a mobile app that boosts safety of travellers by tracking the route they are taking and posting it on social media networks. NASSCOM Foundation pioneered the NASSCOM Social Innovation Honours in 2008 and since then the Honours have attracted innovative projects from NGOs, corporates, social enterprises, government bodies, PSUs, students, groups, and individuals. Each year, participants showcase their exceptional use of ICT for social transformation to an eminent jury. In the last edition, Mr. S. Ramadorai, Vice Chairman of TCS and Advisor to the Prime Minister, had led the Grand Jury. Mr. Anand G. Mahindra, Chairman of Mahindra & Mahindra and Mr. Narayan Murthy, Chairman of Infosys have in the past been associated with the Honours, chairing the Jury. The winners will present their innovations at the prestigious NASSCOM India Leadership Forum event in February 2014. If you are among those who have an idea, prototype or an initiative in implementation, this forum is for you!! To complete the registration and application process and more information please visit www.nsih.net. For any queries, please write at nsih@nasscomfoundation.org. You can also call us at 022-28328518. Last Date of applying for NSIH: 20 October 2013.